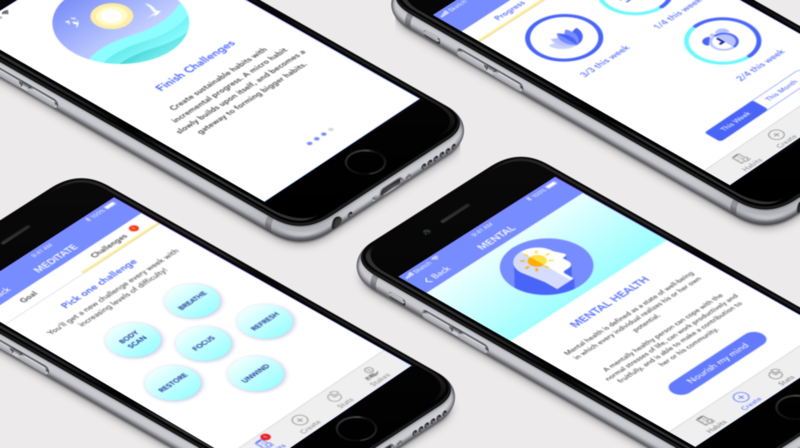 Rise is a habit-forming and tracking application that focuses on improving the health and wellness of working professionals through the creation of meaningful morning habits. Humans are creatures of habit. We all have healthy habits we'd like to build. Yet, even with the best intentions, building a new habit is something many people struggle to do. Why, when we know what we want, is it still so hard to follow through? My design challenge was find a way to help people build lasting habits. I set out to identify the problem and possible solutions, and create a mobile app over 4 week-long sprints. Working professionals find it difficult to maintain a work-life balance. They are overwhelmingly stressed, which leads to neglect of their physical, mental, financial, and spiritual health. They lack the tools to motivate and discipline themselves to manage their time and energy productively. A lack of self-efficacy can lead to the abandonment of the pursuit of desired goals. High self-efficacy is the optimistic strength of your belief in your ability to complete tasks and produce desired outcomes. Setting goals is one of the most necessary steps to effectuating change in your life. Your goals must be not only realistic to begin with but also constantly readjusted to account for what happens as you go along. By increasing and mastering your self-efficacy, you allow yourself to succeed in life by staying motivated, committed and optimistic about following through without prematurely giving up on achieving your reasonable goals and adjusting your destiny. How might we encourage and incentivise working professionals to form healthy habits so they that can balance their lives, optimise their health, and maximise their productivity? As part of my research, I read "The Power of Habit" by Charles Duhigg and "The Seven Habits of Highly Effective People" by Stephen Covey, and "The Miracle Morning" by Hal Elrod, all of which proposed some key concepts as solutions to my design challenge. Key Takeaways from "The 7 Habits of Highly Effective People"
Talks about the concept of Circle of Influence and Circle of Concern. Don't sit and wait in a reactive mode, waiting for problems to happen (Circle of Concern) before taking action. Envision what you want in the future so you can work and plan towards it. To be effective you need to act based on principles and constantly review your mission statement. Balance and renew your resources, energy, and health to create a sustainable, long-term, effective lifestyle. It primarily emphasizes exercise for physical renewal, good prayer, good reading for mental renewal, and service to society for spiritual renewal. Key Takeaways from "The Power of Habit"
Willpower is a limited resource that you can burn up quickly, but it gets stronger over time if you don't overexert yourself. Habits exist as "loops" or cycles, and form most easily when they are repeated at the same time and in the same context. KEY TAKEAWAYS FROM "THE MIRACLE MORNING"
By simply changing the way you wake up in the morning, you can transform any area of your life, faster than you ever thought possible. Your personal energy and willpower is the highest in the morning. It is an opportune time to create a habit and make a change. Every day you and I wake up, we face the same universal challenge: to overcome mediocrity and live to our full potential. I believe that forming healthy morning habits will improve the physical, mental, and emotional well-being of working professionals. It will also increase their daily productivity, creativity, and efficiency. 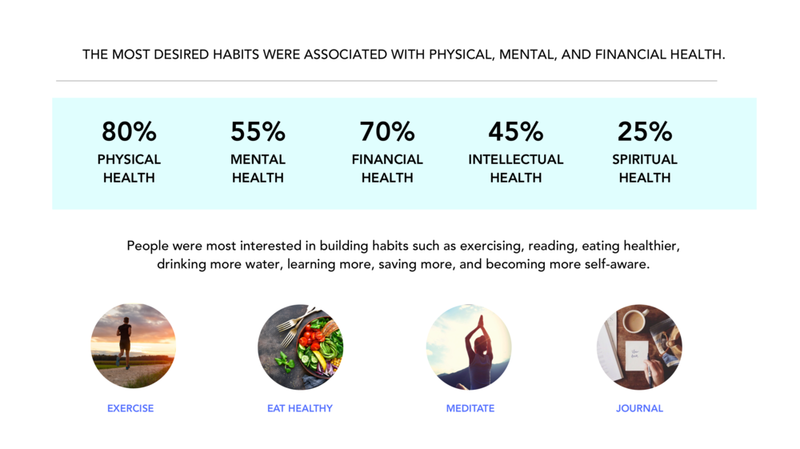 I conducted surveys and in-depth personal interviews to identify which habits people are most interested in building, and what kind challenges they face. Based on statistical research, people prioritized health and well-being above their professional career and social activities. They were willing to invest between 15-30 minutes in the morning to improve their overall quality of life. User Personas are Archetypes to identify user profile, behaviour, needs, expectations in order to design better for them. Using the key insights from my interviews, I created primary and secondary personas representing the goals and behaviours of my users. 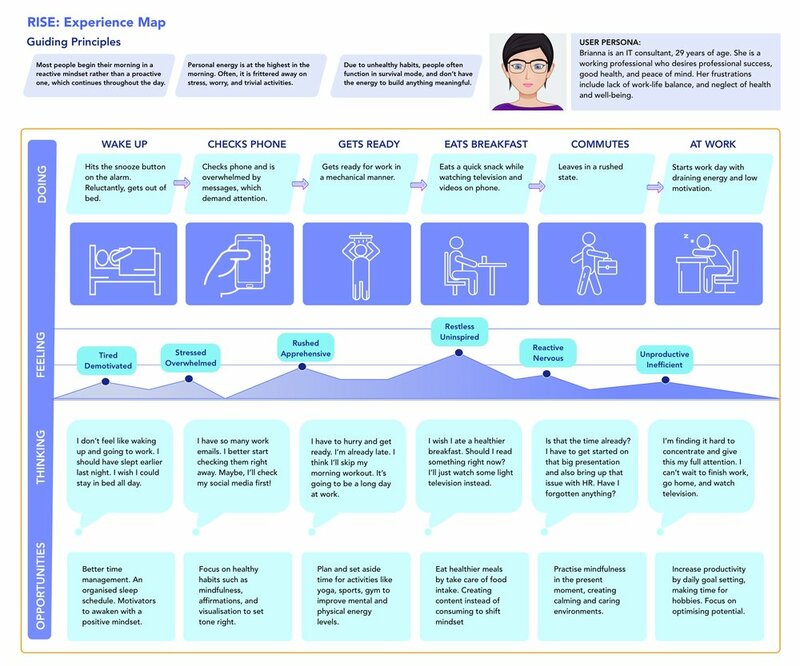 An experience map is a visual artefact to empathetically understand a user's behaviours and moods throughout an experience.I mapped out the typical morning routine of a working professional, and identified a number of challenges and opportunities that could potentially mitigate the challenges faced. Micro habits are an action that requires minimal motivation or effort to complete. The idea is over time; a micro habit will slowly build on top of itself and result in something significant. The core task flow involves setting goals, completing smaller challenges, and raising the stakes to achieve those goals. I started out with Crazy 8's to kickstart my ideation process. After many sketches, I transitioned into low-fidelity, grey-scale wireframes. After rounds of user testing and creative problem solving through iterative design, I finalised my grey-scale wireframes. Wireframes represent the skeletal, basic structure of a website or application. They are primarily grayscale to showcase functionality, content, flow, and usability. Once the branding and visual identity of the app were completed, I implemented changes to the low fidelity wireframes with feedback received from user testing sessions and created high fidelity wireframes showing how the completed app would appear. 1. Expand the Stakes and Statistics Feature. 2. Build out additional screens. 4. User test all upcoming changes.